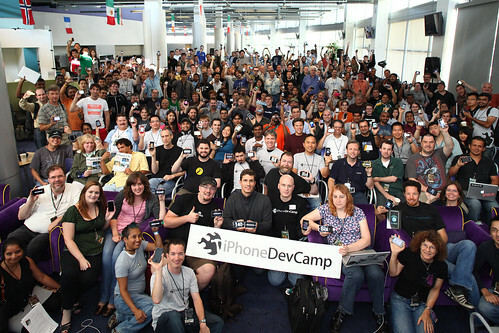 The iPhoneDevCamp this weekend (July 7-8) was an absolute hit! The hack-a-thon to develop iPhone applications resulted in 48 apps and websites being demonstrated. Some great collaboration took place! Creative enthusiasts, developers, designers and testers all worked together to have some fun creating neat iPhone Apps. However, FOSS people like me do feel that the iPhone platform should be opened up to encourage lots of useful apps to be developed by talent outside Apple. The web sites and applications created at the hack-a-thon are available here. My thanks to the organizers – Raven Zachary, Whurley, Chris Allen and other team members for a tremendous job managing logistics, press and the sub-events. And Adobe’s venue was perfect for the camp. 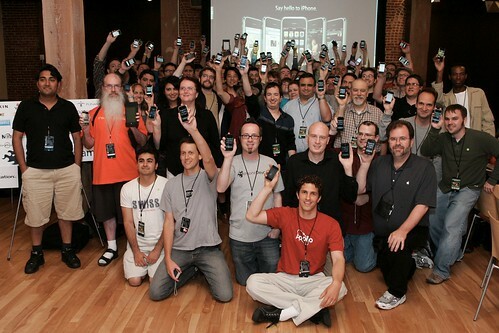 Here is the group photo of some of the attending iPhone owners. I missed it. Hopefully, better luck next time. This entry was posted in Apple, Barcamp, Community, iPhone and tagged Apple, Barcamp, Community, iPhone on July 9, 2007 by Alolita Sharma. Is this cool or what? An iPhoneDevCamp starting today at sundown through Sunday (July 6-8) in San Francisco at Adobe’s offices at 601 Townsend St. Many companies and individuals have pitched in to make this camp happen. My friend, Danese Cooper said about the camp – “It’s a great example of a spontaneous community forming around really compelling technologies,” in an interview with the SF Chronicle about the upcoming DevCamp. There are 400+ designers, developers, testers and iPhone owners signed up already. By the end of Sunday, there will be some cool web apps and sites which are even iPhone friendly. If you’re in the area, sign up, bring your laptop or iPhone and join in. See you there this weekend. This entry was posted in Apple, Barcamp, Community, iPhone and tagged Apple, Barcamp, Community, iPhone on July 6, 2007 by Alolita Sharma.